If you are going to write about gamification, serious games and any other game-based solution concept, at some point you should also be playing games. Firstly because they are meant to be fun and take you out of the regular, and secondly because to be able to create game-like experiences, you need to know what games are doing. I don’t necessarily do reviews of games, but rather use them as lenses to look at an issue that people have or what the (social) commentary that that game can have on the behaviour of people. One of the previous ones was my look at the game Frostpunk, and how it used an emotion-inducing narrative to engage its players in meaningful choices and gameplay. For this piece, I’ve chosen Sekrio, primarily because it’s one of the few games I’ve recently thoroughly enjoyed, despite its high difficulty. But also because of the debate, it has sparked around this difficulty and various individuals calling for it to be made easier for fear of it not allowing others to experience it. If you are unaware of Sekiro, Shadows die Twice, it is a fantasy game set in a fictional version of Japan’s Sengoku period in the late 16th Century. You play as a Ronin-type Shinobi with a prosthetic arm, battling enemies in a specific quest. The game comes from the company FromSoftware, who is famous for creating the Dark Souls series and Bloodborne. These games have always been known for being incredibly difficult, but also for their manner in which they relay a narrative, as I’ve covered here a few times in the piece about minimalist storytelling and environmental storytelling. The Dark Souls series has always created a debate around difficulty within games and with the release of Sekiro, this has arisen again. Though perhaps due to its greater recognition as a company and the larger simultaneous release of Sekiro on multiple platforms, the discussion has hit what looks like to be a more mainstream audience. Much of the discussion (or argument) is around lowering difficulty to allow greater access to more people for popular games. Much of the discussion I feel is missing a point around the concepts of difficulty. Difficulty or within the game and gamification space, Hard Fun, has varying definitions, is it difficult because the narrative/story is elusive, is there a high skill barrier, is the learning or comprehension too lengthy or obscure or too alien from everyday understanding? Let’s jump into the dangerous waters of the debate of easy versus hard and the merits of having a challenging and/or difficult experience when it comes to playing a game (-like) experience. The reason I found the discussion around the difficulty of Sekiro so intriguing is that for me personally, I’ve found it much more accessible, in terms of its challenge, than any previous FromSoftware title that I’ve played. And I use the term accessible here in reference to entry into the gameplay, ‘accessibility’ in terms of physical access is something I will touch on much later. Having thus achieved something in Sekiro I was never able to in the Souls games is why I feel that difficulty in games can be seen as something positive. Having said that, you should be aware of the difference between difficult and punishing. A difficult game I believe is more around learning about and understanding the game, thus meaning that anyone should be able to achieve something in it, even if not everyone can. Punishing games, on the other hand, are those that wilfully stop a player from progressing by placing a task that only 1% of a population may be able to overcome. For example, something like Flappy Bird. Though punishing is also nuanced in terms of personal ability, for example, if I play an online FPS like PUBG or Apex Legends, it is certainly more about reflexes than learning pattern recognition in a boss fight. As I am not as quick as I once was in high school, the game can be a punishing experience for me, and no amount of pattern recognition will make me better at it. Thankfully the punishing experience in these types of games does not gate content. One of the first challenges that games, and specifically FromSoftware games, use is the way in which the narrative is delivered, as well as in what order you experience it. Much of the narrative experience is traditionally delivered through environmental storytelling. The story can be discovered by reading descriptions, and ‘reading’ how the environment looks; this character’s armour looks the same as the armour seller in the town, perhaps they are related and perhaps this one met his end from something I should be wary of – you thus uncovered a subtle narrative. Sekiro is more straightforward with its narrative, but the player can still experience it in a non-linear way if they so choose. The narrative thus influences the gameplay and choices a player can make, there is no set path to follow. The first challenge a player has then is making the difficult decision of which path to follow, they are required to think tactically, considering the choices they have and the experiences they have had thus far. If one path is too difficult initially, then perhaps choosing a different one has a more realistic challenge at this point in time. The option of making decisions in this way is generally what difficulty should be about within any game (-like) experience. Every game has its own learning curve, you as the player or participant need to learn the rules of the world you have entered. And much like the real world, that those games try to emulate, these rules are learned and understood through persistence and perseverance. Though I do want to add that learning the rules of a game is not the same as learning mechanics, the fact that the basic WASD keys are used for movement is a given in most games, choosing a different key set then falls into the punishing a player category, not challenging them. Offering different modes of difficulty is a difficult discussion to have, and some of the discussions around Sekrio’s difficulty seem to be missing the mark or are inconsistent. Some seem to be about the ability of the participant as a whole versus an inability to grasp certain rules within the game’s semiotic domain. Altering a game’s difficulty should be possible, but perhaps there should be a consequence to it. An example of this can be found in group games, such as Escape Rooms, where if the participants want it to be easier, they have the option of requesting a Hint (sometimes). The consequence of the Hint though is that they now have less time to complete the activity. Some do argue that if there is such an option of lowering the difficulty momentarily, then that would be too great a temptation to use it anyway, thus ruining the experience. If that is your belief then I would say that this is a good time for some self-reflection around what you are expecting to gain from the experience, it’s an inherent difficulty, and what your self-control is around apparently avoidable temptations. In relation to other articles that I’ve written around difficulty, challenges, failure and consequences in game (-like) experiences, is that each of these exists to teach us something about ourselves and the world, while in a safe space (whether we realize those teachings immediately or not). The intrinsic motivation of a difficult challenge is achieving something for/of personal value. If that experience, however, is gated in some-way then we are unfortunately unable to receive those learnings. Perhaps, in that case, we should reconsider what the value of the experience really is, and what the reasoning behind it is. 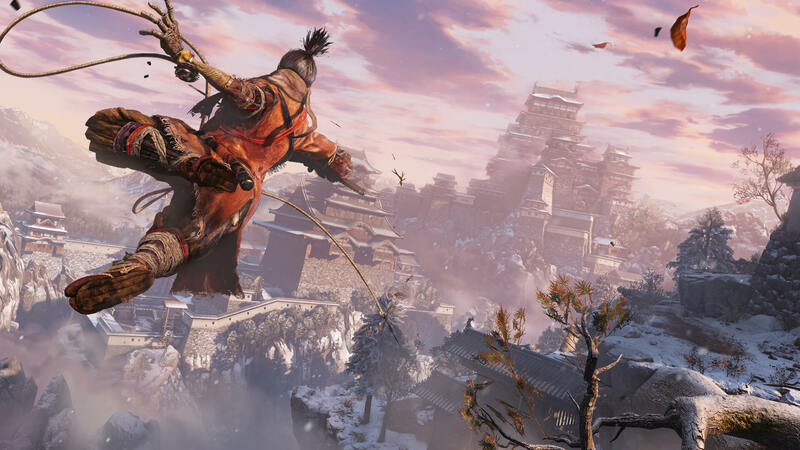 For difficult games like Sekiro, the experience may be gated at times, but the game follows the same consistent rules throughout the game. If you are able to beat one aspect of it, then there is the possibility for you to learn and improve to overcome the rest of it. Having difficulty in game (-like) experiences is a good thing to have. We need and crave challenges and overcoming them can only be positive for our continued growth. Games such as Sekiro help some us to realise this. I am however left wondering whether the discussion or argument around difficulty that Sekiro has created is simply because FromSoftware’s popularity has broken into the mainstream. And with that the many individuals who have the illusion that their voice is one that others necessarily want to hear – this is in particular reference to those that feel a need to speak up for those that are in a position of which they likely have little understanding of to start with. As I had mentioned earlier, some of the discussion around difficulty has been around accessibility. Accessibility here is whether those that are disabled have the opportunity to partake in a game (-like) experience. The difficulty level, in this case, should never include any level of inaccessibility, and examples that this hasn’t been the issue in previous and current titles from FromSoftware are plentiful. Perhaps Sekiro’s popularity has made it a more visible starting point to have this discussion around what constitutes as something being difficult. Granting more options to allow those that are disabled to engage is something to strive for, and I believe that this argument stands separate from the one around a games actual difficulty and learning curve. Those of us who have the good fortune of being fully able should not question the idea of making a game more accessible as lowering the quality of the experience. Guitar Hero for example certainly lowered the ‘difficulty’ in being able to play songs like Paint it Black by the Rolling Stones, no longer did you need the strength in your hand to hold the strings in the right chords and notes – despite all that I, who can hold a regular guitar, am still terrible at the game. The greater accessibility did not lower the difficulty of following the rhythm of a song like Paint it Black for me, though someone with a good sense of rhythm, able or disabled, is probably amazing at it. With all of that said, I am not against different modes of difficulty as a principle, but I also do not know the true intentions behind FromSoftware’s design choices. But adding different difficulty modes is a not an experience-breaking issue, and it certainly doesn’t break a game. Many games have had various difficulty settings from the start or have we all forgotten the Nightmare setting in Doom. Conversely though, I am of the opinion that like many things created by us humans, they do not need to be for everyone, everywhere, in the entire population. At times, some things, just simply aren’t for you, unfortunately, and as crass as it may sound, that’s life, live with it. As long as the game experience is about a realistic difficulty (not inaccessibility) then you yourself make the personal choice to challenge yourself for greater achievements and to learn something as well. Learning, after all, is something to strive for, and an experience that allows this is good – and if it has full-accessibility options then that’s great. I hope that this piece has given you some food for thought and helped improve your own methods or at least offered a different viewpoint to consider. Please do check out the other posts on æStranger.com, and please do leave a comment or contact us if you have some ideas of your own that you wish to discuss or if you would like to see other topics discussed. Please do Share if you found it helpful and know of someone who would it find it helpful as well.